In the 1980's with the explosion of youth in the parish, Cratloe started to make considerable inroads in Underage Hurling in the County. Two Under 12 Championships were delivered in 82 'and 84', and A' Finals were being contested again in the club. The climax came when the Feile Na Gael was held in the County in 1986 and 1987. Cratloe were crowned as All-Ireland Division Two Champions in the first year when they beat Smith O Briens in an all Clare showdown. It was around this time that, in the clubs 100-year anniversary that negotiation opened to purchase a new playing field and facilities in the parish. For a century Cratloe's hurlers young and old graduated from the legendary 'Hollow' generously leased from the Ryan Family of Ballymorris. In 1987 the club purchased an eight-acre site from the same family and developed through the kindness of its own parishioners what is today Pairc Michael Ui Heithir. The grounds officially opened in 1991 two years after the clubs U/21's triumphed in the county B championship. T. Hawes, P. O Gorman, J. Keogh, K. Gleeson, K. Galvin, J. O Gorman, E. O Halloran, D. Considine, M. O Gorman, D. Ryan, C. Thornbury (Capt. ), T. O Halloran, F. O Hara, J. O Brien, R. Murphy, R. O Hara, B. Stritch, S. Wall, C. Galvin, A. McMahon, N. McMahon, B. Madigan, A. Quinn, M. Reidy, C. O Brien, M. Danagher. Much of that team progressed to experience the heartbreak of yet another Intermediate Final defeat in 1990 when archrivals Sixmilebridge scored a goal well into injury time to defeat a Cratloe team who had been for years knocking on the door to make the breakthrough back into Senior hurling. The start of that breakthrough came in 1992 when the club enjoyed perhaps its greatest day convincingly beating Eire Og to claim the county Premier U/21 hurling title. Tommy Hawes, Donie Minouge, Anthony Quinn, Dara Collins, Conor Galvin, Joseph O Gorman, Mark Riedy, Michael O Gorman, Enda Wall, Rory Murphy, Colm O Brien, Brendan Madigan, Ronan O Hara. Keith Galvin, Donie Ryan. Fiachra O Hara, Seamus Stritch, Andy McMahon, Brian Stritch, David Madigan Kevin Deegan,. Two years after the U/21 success Cratloe, finally, after a decade of close calls and disappointment, the club won its fourth intermediate title when defeating Ogonnelloe in Cusack Park in 1994. Michael Deegan captained the side and led them to the County Senior Semi-Final in their debut year at senior level in 1995. P. McMahon, T O Halloran, A. McMahon, P. McMahon, M. Deegan (Capt.) J. O Gorman, E. Wall, M. O Gorman, D. Considine, N. McMahon, C. Galvin, M. O Halloran, D. Ryan, R. O Hara, D. Chaplin, T. Hawes, A. Quin, S. Stritch, J. O'Brien. O Connor, C. O Brien, C. Thornbury, B. Stritch. 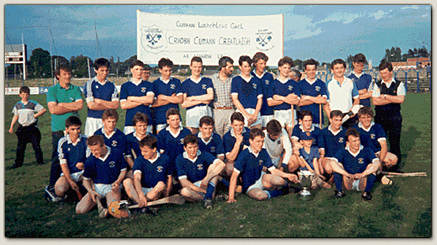 Cratloe has made major strides throughout the 1990's and into the new century, most notably at underage level. In an amazing achievement the Minor club has won titles at every age group in both football and hurling in the last decade. Amongst them came the hard fought and Cratloe's only ever Minor Hurling Championship title in the C grade in 1996 when the same outfit completed the double in football and hurling, as they did at U/14 level in 1992. In 1997 the club won the U/21 C title, and went one better in 2001 when Joe McGrath steered them to the U/21 b championship. 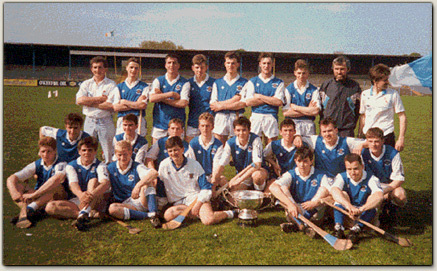 In 2002 Cratloe were narrowly defeated by the minimum of margins in the county U/21A hurling final but in football were crowned County Junior A champions. Nowadays Cratloe with its rising population is widely regarded as one of the up and coming forces in Clare G.A.A. It has become a regular nursery for intercounty representatives; in both codes let it be stressed. The club, based at Pairc Michael Ui hEithir where it is waiting to build a multi-purpose sports hall, caters for teams of every age group in both hurling and football. Whether in the 'hollow' or further a field or be it in either green or blue and white Cratloe have long being recognized as having one of the proudest and oldest clubs in Clare. May it continue long into the future.